The pcDuino3 is a high performance, cost effective mini PC platform that runs full-featured operating systems such as Ubuntu and Android. 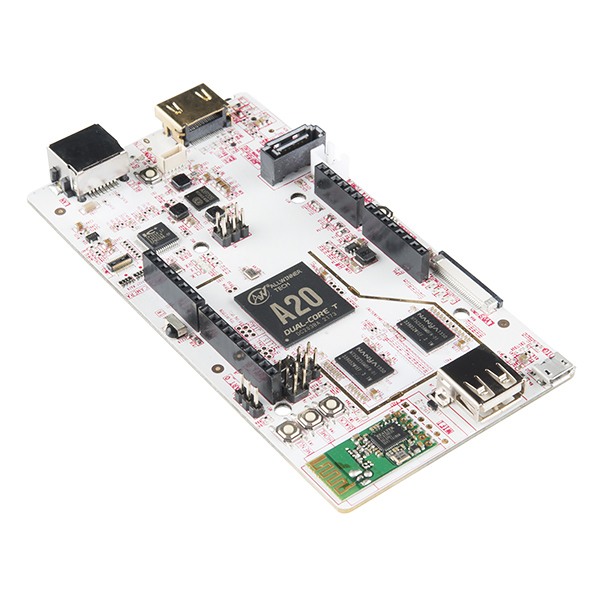 In addition to running Linux and Android, the pcDuino3 has support for programming languages such as C, C++, Java, Python, Arduino, and more. You can even use your favorite Arduino shields for added hardware capability. The pcDuino3 has an impressive set of features including an IR receiver, SATA host, USB-OTG, LVDS LCD interface, MIPI camera interface, 3.5mm audio output, battery header, WiFi, Ethernet, and more. If you're looking for the 'kitchen sink' of development boards, look no further. The pcDuino acts much like a computer, needing only a 5v (2A) power supply, keyboard, mouse and display to get running. You can even use the USB-OTG to connect remotely. Connect it to your network with either the WiFi module or Ethernet jack so you can log data, run a web server, or control devices remotely. The more powerful pcDuino uses a dual core A20 processor which makes it one of the most powerful single board computers on the market. An API has been developed for the pcDuino3 that allows the user to access all of the functions that you would expect using simple Arduino-style language. Additionally Ubuntu and Android OS Images can be found in the Documents section below. Why does it say MIPI CSI serial camera interface but on the schematic it's showing a parallel interface? What is CSI0? Does that even exist? If I buy a MIPI CSI camera, will this be a good choice for this board? Judging by the schematic this would not work. Ironically the cameras offered for this board also claim the CSI interface but their schematics also show a parallel interface, what is up with that? I see pcDuino3 supports a touch LCD using LVDS connector. Where do we find these touch LCD's with this type of connector. They are in the works now. Is an ipad screen compatible with this? iPad' screen has a DisplayPort interface, so the answer is no, i suppose. They might, but it won't be the cleanest way of doing it. We have something that will work well with this in the works. We don't really have an early notification system, but it will be announced on our email newsletter. I'm also looking for one of these LCD's so let me know if you find an appropriate one! Has anybody tried xbmc on it? A build of it comes with the OS image. I didn't do much with it, but the UI seemed a fair bit snappier than my RasPI. One thing I've hoped for on a board capable of running Linux is a battery-backed-up clock so that setting the time at bootup can be done without a network connection or an add-on board. If you ever update this design, I hope you'll consider adding that. Other than that, this guy looks pretty nifty. The A20 has a RTC that uses a 30 bit counter to count elapsed time in YY-MM-DD and HH-MM-SS. It continues to operate via battery backup when the system is powered off. The RTC has an independent power pin (RTCVDD)(A20-Pin K8) which is connected to the AXP209 PMU(pin 28) on the pcDuino3. In the power-down mode this pin should continue to have power if a battery is connected to J7. (I have not verified that the PMU is programmed as such, but the capability is there). 5V 2A wall warts are often used for USB Hubs. They are also recommended for the Raspberry PI if WiFi and other attachments are used. In any event, they are all over the place. The last one I bought came from Amazon. Yeah, we have some coming in soon too. The specifications for pcDuino3 Nano says it supports HDMI 1.4. Are there other ways of powering it up apart from using the 5V 2A usb charger? Saw this ==> http://www.instructables.com/id/Solder-USB-power-cable-to-Raspberry-Pi/ and thought maybe it could work on the PCduino3. Has anyone tried this on the PCduino? Two questions here. How many UARTs does it have? And can they be set to low baud rates, like 45bauds? (Sometimes UARTs cannot go under 300 bauds by hardware -divisors- limitations, like the typical USB-RS232 dongles). This is very important for me. Does anyone know of good solution for powering this board with batteries. I'm looking into buying this board, but does it have the uboot saveenv command disabled, like I read the first pcduino had? Also, does this board have a JTAG header (not necessarily populated with pins)? Thanks. I just ordered the pcduino 3 and it is only running lubuntu and I want it to run regular ubuntu. I want to install chrome and minecraft. Are there any sbc boards that are faster,better then this? And if so the name plz? While I'm not familiar with all the SBCs out there, remember, there is always something faster out there. As for better that depends on what you are trying to do. Take the new Edison for example. If you are looking for a small form factor, and low power board with no need for a video display then it is better. If you are looking for a board to build a media server with and want to connect your TV, hard drive, keyboard, mouse etc. then this board is better. If you are looking for something under $50 with tons of community support than the Raspberry Pi is probably better. Figure out your application and what you need to do and then find a board that does it. I'm playing around with some ideas for a racing motorcycle. They run from a boost control system and data logger (on the simple end of the spectrum) to a fuel injection control system (on the other end). One thing that is I will need is to have lots of external interrupts that I can use. I've been doing some reading on the pcduino and it looks like my programming will more likely be linux code than arduino code. It's not that I mind but that makes the job more complex. Can I fire interrupts on edges from more than just the two standard exernal pins with the pcduino? I'm also considering a due as I've read some blogs and other articles saying that any of it's pins can be used. Also, since this is a real linux device what's it's boot time? I'll need something that can come to life in a couple seconds. And is it's performance fast enough to be considered real time? I'm still digging and I may buy one of each and experiment but any answers that can be provided will be appreciated. I suspect that the pcduino may not be the board that I'm looking for, but it has a lot of horsepower and that makes it appear attractive. Hi everyone, Can i run scratch 2.0 on pcduino v3? I really want to take full advantage of the webcam motion detecting of scratch 2.0. Hi, are there any plans to offer the pcduino3 nano on sparkfun. I'm a little vexed at the availability of the beaglebone, and the pcduino3 nano seems equivalent, if not more powerful computer. I'm just having some troubles sourcing it. It should be cheaper possibly as they've stripped a lot of the extraneous peripherals off the board in the nano. Will the PCduino3 hook up via l2c to an Arduino mega using the 5V line and is it just a master or can I request master / slave from it? as an ARM device, when running ubuntu, do you need to worry about device tree overlays? Does anyone have a tutorial on this? i have a sata hdd that runs of 5v at 600mA will the sata power port on this board power this? So does the clear enclosure you guys sell fit this board? Hi guy, do you know when you'll be getting more of these in stock? If we have an estimate, we put it below the prices at the top of the product page. You can also click on the "notify me" button to receive an email when they're back in stock (and we don't use your address for anything else). The only issue so far. The documentation is absolute garbage. A lot of it still covers only the older versions of the board. If anyone could recommend a better source I am open to suggestions. So is there a compatible case in the works, specifically something like the generic one that works with the pcduino2 that also allows extension plates so you can stack your shields as high as the sky? i have the camera from my raspberry pi, with a similar looking connector.... can i use it ? For that price... I would rather have a Mini-ITX motherboard (like this and this). Of course you have to purchase ram, but it can be bought relatively cheap these days. As for GPIO... Bitbang the serial/parallel port or use a FTDI FT-X series converter to handle that. You realize that this is only the motherboard. You need to add a CPU, a hard disk, a hefty power supply and a wireless I/F if you need wireless. By the time you add all these aforementioned items, you are in the $200 price range. Most modern BIOSes support booting from USB flash drives ($5), so no problem there. A 45W PSU should work nicely. Which LiPo can be used with PcDuino3 ? I'm really glad to see a product like this finally wetting it's feet into the powerful possibilites of the GHz range. Good show. If your older monitor has the correct type of DVI input you can use a HDMI to DVI cable. Anyone know what SATA version? Everything just says "SATA Host Socket". This could make for a nice media server. According to the Allwinner A20 User manual.. LINK: http://dl.linux-sunxi.org/A20/A20%20User%20Manual%202013-03-22.pdf "Support SATA 1.5Gbs and SATA 3.0Gb/s" "Comply with SATA spec 2.6"
Little late here but thanks for the reply. About what I expected, didn't want to assume anything though. Thinking of buying one of these as an XBMC media server with HTTP and MySql and sticking a terabyte drive on it. Enough already with - yet another SoC?? Yikes, we're barely able to keep up with Leonardo, Galileo, Arduino, Berry Pi's, Banana Pis, Minnows, Sharks, Bone-Eating Beagles and what not. Geez guys - take a chill pill! Hehe, just kidding! :P It's great. Now if I could have a 32 hour day please so I can have enough time to try everything!!! Does it have gigabit ethernet or only 10/100? If the schematic is accurate, the ethernet transceiver (IP101A_LF) and the port transformer ICs (BT16A02/NS0014) are both for 10/100 Mbps, not gigabit. Found by a google search: http://www.recomb-omsk.ru/published/SC/html/scripts/doc/IP101A.pdf and http://www.tnk.net.cn/PIC/PIC/2011831953200.pdf . official product page says 100Mbit. Are there any real-time operating systems available for this board? "The pcDuino acts much like a computer, needing only a 5v (2A) power supply, keyboard, mouse and display to get running"
Yep, the other questions are correct. You can run it standalone, or use something like Putty to connect to it, etc. You can connect to the computer through the serial terminal interface using a terminal program like Putty (if the PCduino boots to an OS). There should be a header on the pcDuino for this interface, as the pcDuino1 had it. There is a serial debug port - see Chapter 2 of the Tutorials. After the board is configured with, say, Ubuntu, you can enable SSH and connect via WiFi or wired Ethernet. Well it says it can emulate an arduino, so you can program from another computer and run it like you would an UNO. Actually the Arduino emulation is based on a custom version of the Arduino IDE that comes on the board. You can program using the IDE and then for the board select the PCDuino (instead of the Uno or other Arduino board) and hit upload/run and have it run. Keep in mind that there other ways to talk to the I/O pins, but this is Arduino emulation part. Edit: Following the Tutorials link to the pcDuino website, then to Chapter 1: Hardware and Software Introductions of pcDuino, says it takes 2A as well. Wow. Header P4 exists to supply power to an attached 2.5" HDD. (ref: http://learn.linksprite.com/pcduino/quick-start/explaination-of-pcduino3-headers/ ) It's typical for startup on a laptop drive to draw 500mA - 600mA from the power supply. You've got two USB ports (one of which is OTG, but can be driven in host mode) that are required to be able to supply a minimum of 100 mA ea, but that SHOULD be able to source up to 500 mA on request. There's 1 - 1.5A of supply current right there, just in pass-through power supplies. Add WiFi transmit power, power to any Arduino shields you tack onto the board, power to anything connected to any of the various non-Arduino expansion ports.... And that's not counting the power consumption of any chips on the actual board. So yeah. You MIGHT be able to power just the board off a 500mA USB port. Start driving HDMI, LCD, Ethernet, you'll probably quickly get to the point where even 1A isn't enough current anymore. Wow, I hadn't thought about it needing to source current, I've never done any single board computing,. I have a pcDuinov2 and the specifications says the same: 2A. However, it works using a USB3.0 supply (from another computer), so with 800-900mA it works. Maybe, if you use the gpu or many gpio ports you need more. I guess that makes sense. They have to assume someone might use everything at once, and they're gonna put some overhead on it. You are better of getting a RasPi. There is way more support and help with debugging and you can do more with the Pi platform, not to mention the RasPi has a better price. Well. I am a happy user of pcDuino3. The information found on http://www.pcduino.com/wiki/index.php?title=Book is more than complete. I also bought a book on pcDuino3: http://www.amazon.com/dp/B00P4XT6EE/ref=cm_sw_r_tw_dp_CWLvub116VSWR. The book on 18 projects (https://s3.amazonaws.com/pcduino/book/CPK_pcDuino3.pdf) is particularly helpful: Hope it helps. pcDuino is a really great idea! I own a raspberry pi, and love it. But pcduinio adds the next level in arduinio compatibility. Pcduino seems more repondive than my pi too, and built in wireless is awesome. Plug HDMI, mouse/keyboard and power up into fully working Linux. Launch ardunio and blink some LEDs. All in 10 minutes or less! Setting one up for 3d print server seems in order! I purchased pcDuino3 DEV board and LVCD displayer. However, there are not any documents included in the products packages for instructing the wire connections and boot. Also, I encountered difficulties to access pcduino website from Shanghai China for downloading softwares.